Lol nice! Clog-tac-toe anyone ? Thanks for the cool new skins, Sylvi and I are enjoying them, that frog skulk is pretty toxic looking! :> keep up the nice artwork. Also my only criticism of this patch so far is the loud idle sound that tunnels have, sounds like a bloody vacuum. Curious, do you use surround sound headset? 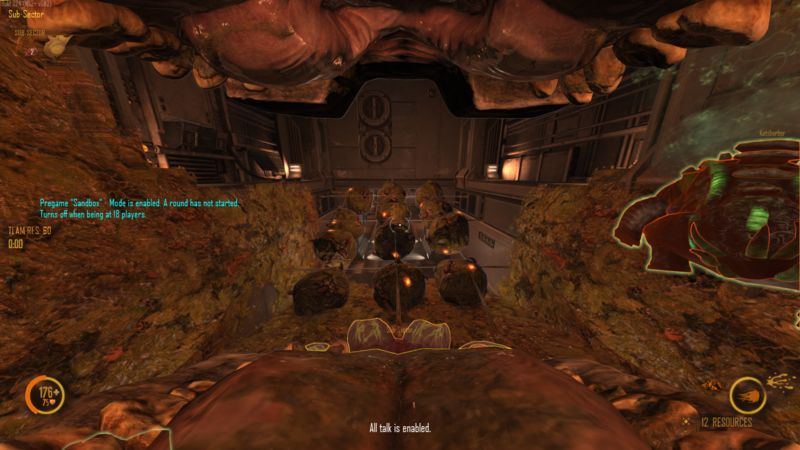 they worked a lot on the idle sound and last I heard it was pretty quiet, but sometimes I know the surround sound mechanism in the headphones can do weird stuff with ns2. On that note : there's currently an issue within our version of fmod that we're aware of and looking into, where if your ingame sound setting is not set to max volume "1", you can experience different audio results. My recommendation is to set that ingame volume to the highest always and then adjust your OS, headset /speaker volume as needed. Also, that sound should only be loud if your essentially directly on top of it. Just outside of bite range it should be almost inaudible while walking. Will all of the individual skins in the cat-pack be available at a later date, unbundled? (e.g. in separate, cheaper, toxin & sandstorm packs that don't include future stuff) Are the skins in the bundle, strictly limited to the bundle? (i.e. get them now or you can't get them later) Or is the thing that is limited- the offer of getting them bundled together at a cheap price? The only one I'm interested in is the green gorge. I'd rather pay $6.29 NZD for a Toxin pack later than $15.49 NZD for a Catalyst Pack now. Ooooh. Congrats to @Kasharic and @pSyk0mAn ! Aren't the skins on the market place yet? The skins are marked as non-tradable and non-marketable so I don't think you can buy them separately. Maybe in the future if UWE decides to make us RICH. I read the trello, lots of cool ideas! And most of them are like "I never thought about this because I used to what things are now but NOW I WANT IT BADLY". Thank you UWE, very cool. I also have a suggestion that instantly came into my mind when I read this: https://trello.com/c/cxRUwLPW/60-reminder-pop-up-that-you-can-purchase-a-lifeform-with-your-pres-amount — add small tokens or whatever symbols to denote how many upgrades you can buy together with that life form. I often don't buy a higher life form the moment I have the pres but wait a bit to also take an upgrade or two (if having the life forms isn't a pressing matter of course). 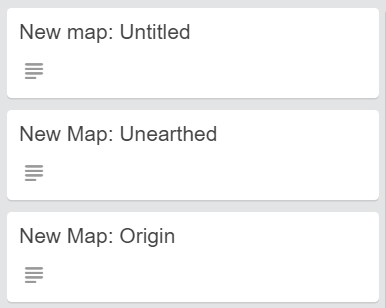 I find it incredibly awesome that this is still being updated! Keep it up guys! I'm not sure I understand this, does it mean massive performance boosts ? Out of curiosity, will it ever be added back to the roadmap to get the dynamic infestation as beautiful as the very first teaser trailer? From what I understand, that was a procedurally generated demo from the Spark Engine itself, so the capabilities should be there, right? I am one of the minority of players that will sacrifice a little performance for more beautiful environments. I believe it wasn't the spark engine, I think it was the previous engine and they had to move away from that to get the functionality they wanted... but I could definitely be wrong. Actually I think you're right. I just found the video and he states that it is being generated over a standard Half Life 2 BSP level. I don't believe the Spark Engine is equipped to render those types of environments. So I change my question; can I formally request that this type of dynamic infestation be added? Hello, does anyone know how skill tier is calculated ? I was Frontiersman (grey color) and now, I am Recruit (blue color) so I lost a rank, why is that so ? Thanks for the answer. * If one team smashes another, but the teams were stacked to make that outcome almost certain, nobody’s skill level changes at the end of the round. Only unexpected victories change skill levels. * Nothing you do during the round other than winning the game has any effect on your skill level. This means that there’s no incentive to rack up kills at the end of the game rather than finishing it, or to play skulk instead of gorge, or to go offense rather than build. * The effect on your score is determined by the time you spent playing the round rather than your points, with the beginning of the game weighted much higher than the end. This means that it doesn’t harm you to join a game that is already lost, because you’ll have played for a very small fraction of the weighted time spent in the game. * If the two teams have a different number of players, this is compensated for automatically by normalizing by the total time across both teams rather than just within a team, and the model predicts that the team with more players will win. * Larger games contribute less to each player’s skill level because the presumption is that each player has a smaller effect on the outcome of the game. * If you are a highly skilled player on a low-skill server, the best thing you can do for your skill ranking is to join the underdog team, and lead them to victory. In short : its a prediction, and solely based on your team winning or losing. ^^ A prediction which seems to cause problems if you are carried to a win every time you end up on one side. Tis an extremely frustrating thing to see... Wish there was a way to "fix" it. It doesn't mean much if you look at the big picture. When someone inflates their elo, they'll be put in the team with less skilled players and eventually stomped back to the level they are actually at. You can't ride other people's elo infinitely because shuffle will put less and less such people to your team. Hiveskill / Hivescore is just a number that shows how likely it is whether You can make your team win in your average environment. They usually follow the big heads (or at least the ones they know). You will always find someone like that in any game. 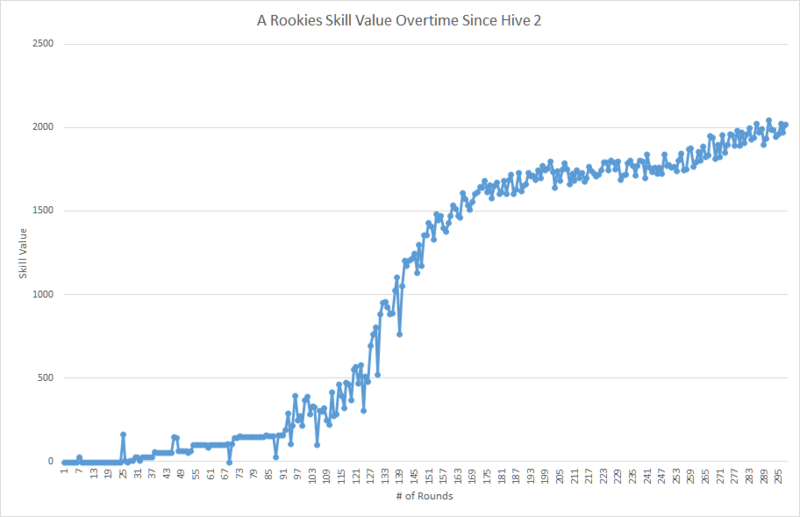 Did you ever see the graphs I made showing various rookies or veterans hive skill values overtime. I mention this because it shows how much each players hive skill oscillates. Here is a collection of 20 of the graphs. These are in no way a random selection of players. Ironhorse also gave a few details that explain why it is really hard to inflate your elo by switching teams, or joining the more skilled players.